Champion Genetics Top and Bottom! 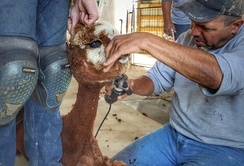 "Let us fulfill your outstanding dreams"
Miracle getting a close shave! Shearing Day is always an exciting and hectic day at our farm! Preparation is the key to success and experience is the best teacher. Having a good setup with the alpacas in close proximity to the shearing area, yet leaving ample room for the shearers is essential. Having all your supplies on hand along with plenty of help is also necessary. 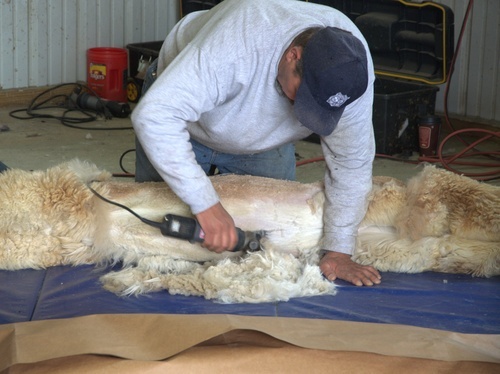 Perhaps the most important component for success is employing the services of a skilled shearer. This should be scheduled several months in advance as most of the good guys are in high demand and run tight schedules. We've used Joel (Jay) Mariacher for the last several years and consider him to be one of the best in the business. Jay is professional and reliable and comes with a great crew of young men to help. By using this site, you agree to Openherd's Terms and Conditions.